In our last post we have explained the way of trading forex with Choppiness Index. Now we are going to introduce you with a very popular technical analysis tool to improve your forex trading experience. 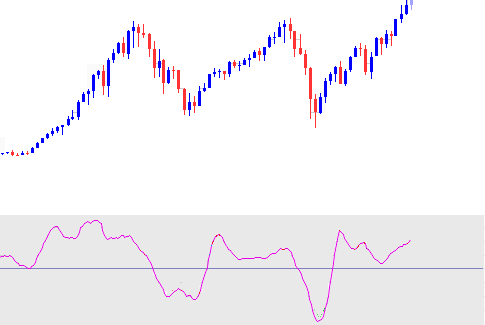 Coppock Carve technical indicator is developed by Edwin Coppock in 1962. CC indicator is a momentum indicator and indicates the long term trend of any financial instruments, it is primarily used to find the major bottoms and tops of the instruments. We can use the CC technical analysis indicator to trade any currency pair. The zero line cross overs of CC technical indicator is used to find the entry and exit signals. When the CC technical indicator crosses the zero line from down, it indicates that the currency pair is going to introduce a bullish trend. When the CC technical indicator crosses the zero line from up, it indicates that the currency pair is going to introduce a bearish trend. It is better, if the entry and exit signals are confirmed by other technical analysis tools. A buy order should be closed, if the sell signal is found, and a sell order should be closed, if a buy signal appears. These are the basic of trading forex with Coppock Curve. If you have any suggestions, you can drop a comment in the section below. I am available on twitter @albab247.